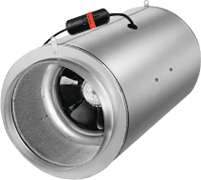 ISO-Max features a powerful and efficient MAX-Fan integrated into a metal silencer lined with a special acoustic material. 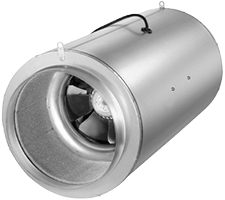 This results in the same efficiency of the MAX-Fan plus the added benefit of extra quiet operation. The 150 and 200 models incorporate 3 speed fixed switching. Again, like the Pro Series fans, these speed positions are tuned into the “sweet spots” allowing the grower to position the fan speed to operate at maximum efficiency.